This is a four-pointed cross with protrusions on the vertical beam that imitate an eight-pointed cross. 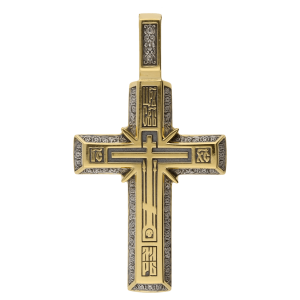 Crosses in this shape were widely popular in Russia from the 14th till the 17th century. 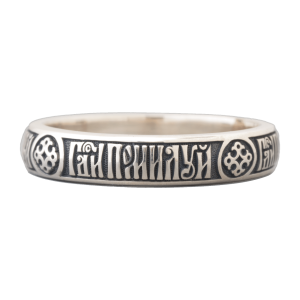 Due to the absence of a fixed or movable ear typical for most jewelry, it is reminiscent of the most ancient stone or wooden crosses, as well as the carved Russian prayer crosses dating back to the 16th-17th centuries. 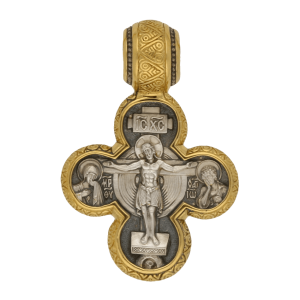 In contrast to these stationary prayer crosses, the content of our cross pendant is more laconic. The front depicts the Crucifixion of our Lord Jesus Christ against the background of the Jerusalem wall, while at the foot of the cross one can see the skull of Adam. 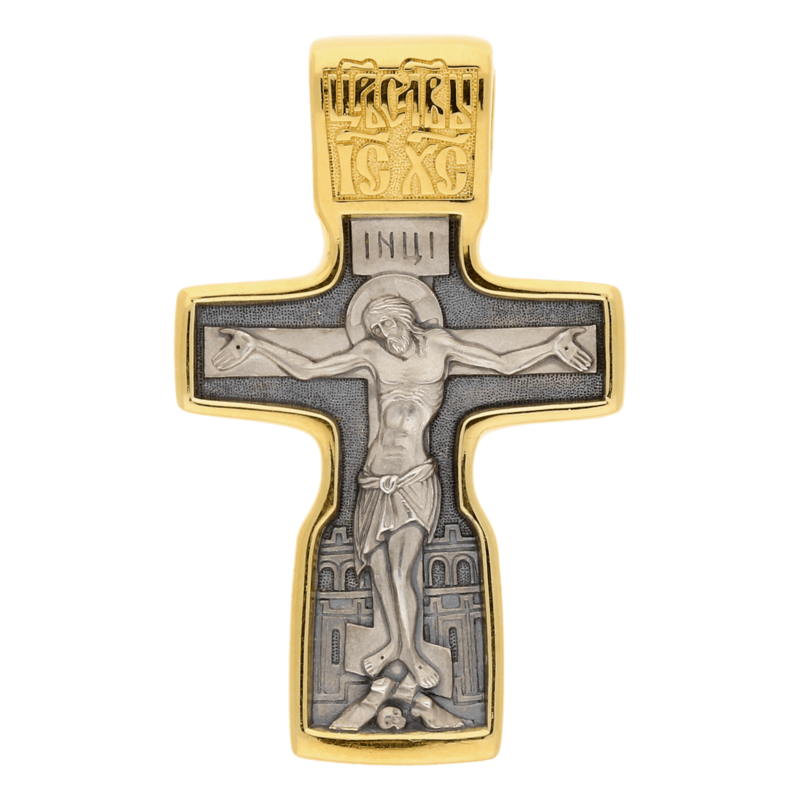 As on the most ancient known crosses, the main and dominant image is that of the Crucified Savior. 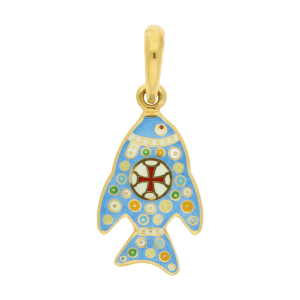 This is emphasized by the general shape of the cross, which echoes the figure of the Crucified One. The walls of Jerusalem in the background carry an extra meaning. This emphasizes the fact that Christ was crucified outside Jerusalem. The Fathers of the Church thought this to have a special significance. For example, St. John Chrysostom writes: “this is why It (the Sacrifice) was made without the city, outside its walls, so that you knew that the Sacrifice was universal, that it was an offering for the entire land and signified the general cleansing of our whole nature”. In addition, the image of the wall refers us to the Heavenly Jerusalem, or the Kingdom of Heaven, which was opened to humans by the atoning Sacrifice of Christ. Against this background, the crucified Lord Himself represents the gate to our salvation, as stated in the Gospel: “I am the door: by me if any man enter in, he shall be saved” (John 10:9). Given that the walls of Jerusalem are symbolized by the altar barrier inside a church, whereas the Royal Doors stand for Christ and the entrance into the Kingdom of Heaven, the image of a wall on a cross adds some lithurgical symbolism to the theme of the Crucifixion. 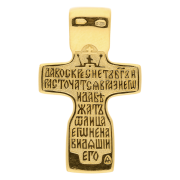 The top of the cross contains the inscription Цр7ь Сл7вы І&С Х&С (“Jesus Christ, the King of Glory”), which is typical for most Russian Crucifixes. It serves to glorify Christ and recalls His Ascension into glory. 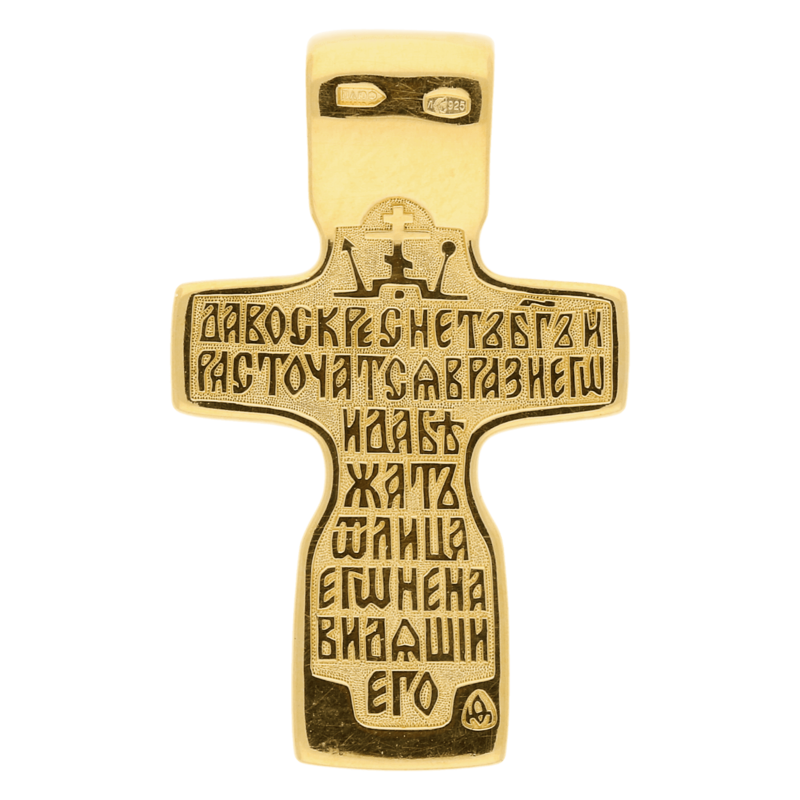 On the reverse there is a prayer to the Holy Cross consisting of the words from Psalm 67, sung in the Easter hymns: Да воскrнетъ бGъ, и3 расточaтсz врази2 є3гw2, и3 да бэжaтъ t лицA є3гw2 ненави1дzщіи є3гw2 (“Let God arise, let his enemies be scattered: let them also that hate him flee before him”). 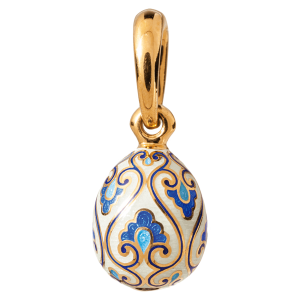 In Russia, it was believed to have a special protective value. This crucifix is as striking as the photograph. The artistry seems almost mystical. 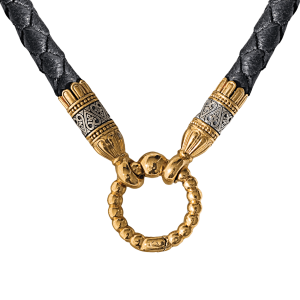 The top of the cross pairs well with a man’s twenty inch chain. Тельный крест четырехконечной формы с выступами на вертикальной балке, имитирующими восьмиконечный крест. Такая форма крестов была широко распространена на Руси с XIV по XVII в. Благодаря отсутствию жесткого или подвижного уха, характерного для большинства ювелирных изделий, она напоминает древнейшие каменные или деревянные крестики, а также русские резные поклонные кресты XVI–XVII вв. Šis kryželis keturgalis, tačiau vertikali jo sija turi iškilimų, kurie daro jį panašesnį į aštuongalį. Priekyje išgraviruotas mūsų Nukryžiuotasis Viešpats prie Jeruzalės sienos, o po Jo Kryžiumi matyti Adomo kaukolė. Pagrindinis yra būtent Išganytojo įvaizdis, kurį pabrėžia bendroji kryžiaus forma, atkartojanti Nukryžiuotojo figūrą. Kitoje pusėje yra malda Šv. Kryžiui, kurią sudaro žodžiai iš 67-ios psalmės, giedamos Velykų laikotarpiu.